mcm-ct | What is the easiest way to identify the MSP intraday? I see many members asking from time to time what color we are tracking. Questions › Category: Market Structure › What is the easiest way to identify the MSP intraday? I see many members asking from time to time what color we are tracking. MSP’s are based on probability computations and sometime 1 out of 4 possible probabilities might come true on that day, or someday 2 probability projections (of diff color) can be true. So best time to asses what is the highest probability MSP for today is to wait until early AM and verify the chart with overnight ramp-up, ramp-down or flat and compare with nearest matching projection. But I have personally seen, you have to slowly watch the turns to ensure you are following the correct MSP. Sometimes you may observer the MSP might have slight error margin (+/- 15/30 min). Peter, Randy and John can better comment on this because they are the experts and I am no expert. I am sharing what I am learning every day so please take this with a grain of salt. Good Luck Trading! Identifying which MSP is likely to track the best is a delicate balance of handicapping starting with the longer term and drilling your way down to the intraday. As you can see in the breakout chart below, this is from Friday's session and I start by figuring out where I am on a weekly chart. In this particular case, the weekly MSP (cyan) is pointed up. We must also note that we are close to a turn date and understand there is a degree of freedom in that date by a week on either side so preparing for a market turn anytime in this window is key. Next we look at the daily (white) which is flat on the Friday session so there is no input from the daily projection. Next we look at the bias below which calls for Thursday to Friday as being downwardly biased which essentially negates the weekly positive to some extent if not completely. Finally we work our way into the four intraday MSP's. 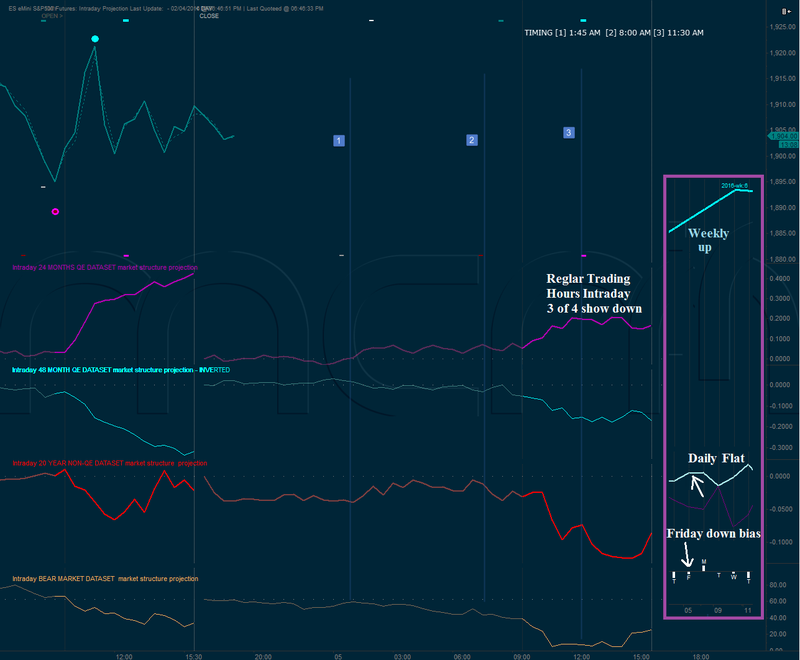 On first glance you can see that three of the four are markedly pointed down for the intraday session so that alone should have you favoring a down scenario with 75% probability since the weekly and Friday bias effectively cancelled each other out and shouldn't influence the intraday. Finally, narrowing down the most probable intraday MSP requires using the timing zones for process of elimination. I personally favored the red in this particular case as a result of how the overnight price action only mimicked the Red and Cyan paths and we were already biased at 75% probability of a downward day which made the cyan upward day least likely. Each new day requires this process to be performed over again. Some days, such as this Friday session, it is very easy to discern which MSP is to be favored. On other days unfortunately the edges are not this obvious. Great summary of your process. Thanks! a yellow capitulation bar 30 min after rth open , suggest continuation down... is MCM planning webinars ?